I MET DON MANY MOONS AGO, BUT AFTER LIVING IN BALI AND SPEAKING WITH A MUTUAL FRIEND, I REALISED THAT WHAT WE SHARE AS A VISION, WAS SO MUCH MORE IN TUNE THAN I KNEW. 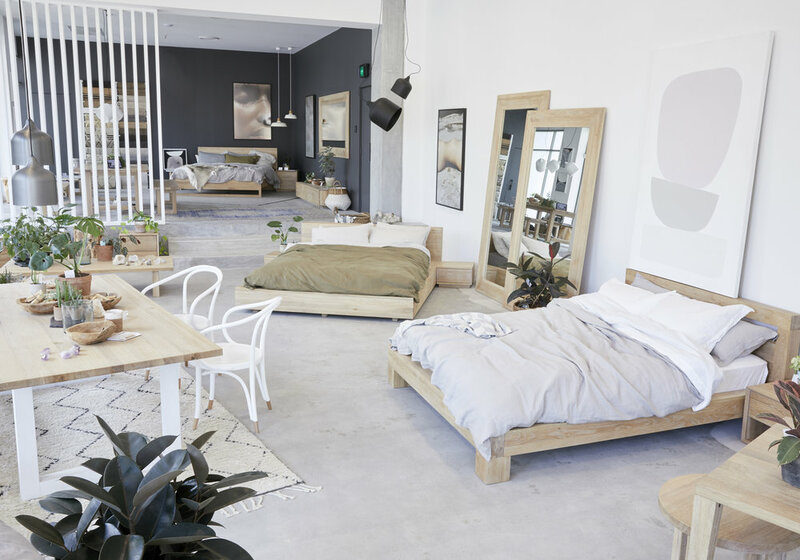 IT WAS A BREATH OF FRESH AIR TO RECONNECT AND DISCOVER A WORLD OF ETHICAL FURNITURE, THAT WAS DESIGNED IN SUCH AN ELEGANT AND TIMELESS MANNER, WITH SUCH A STREAMLINE ENERGY, THAT I TRULY KNEW I WANTED TO DELVE DEEPER INTO IT AND UNDERSTAND IT. I AM SO INTERESTED IN DESIGN, BUT FURNITURE DESIGN IS NOT SOMETHING I HAVE EXPERIENCED. ITS EXCITING AND BEAUTIFUL AND FUNCTIONAL, AND TOTEM ROAD HAS TAKEN IT ONE STEP FURTHER, BEING ECO. ITS THE WHOLE PACKAGE. IM SO THRILLED TO HAVE DON SPEAK TO US AND SHARE HIS VISION. 1. TOTEM ROAD IS A SUSTAINABLE FURNITURE COMPANY. YOU’RE DEDICATED TO BEING ON TREND BUT ALSO CONSCIOUSLY TIMELESS WHILST CARING FOR THE ENVIRONMENT.WHY IS IT IMPORTANT TO YOU TO PRODUCE PRODUCTS THAT ARE AUTHENTIC AND SOURCED ETHICALLY? PRODUCING AUTHENTIC ETHICALLY SOURCED PRODUCTS ARE A KEY PART OF TOTEM ROADS COMMITMENT TO IT FOUNDING ETHOS SURROUNDING SUSTAINABILITY. IF WE CAN PRODUCE PRODUCTS THAT CHANGE THE WAY PEOPLE CONSUME THEN I BELIEVE THE DIFFERENCE WILL BE REAL. IN ITS SIMPLEST FORM, SUSTAINABLE CONSUMPTION ASKS THAT PEOPLE CONSIDER THE IMPACT THAT THEIR CHOICES HAVE ON FUTURE GENERATIONS. ULTIMATELY, I FEEL IT’S ABOUT TRANSFORMING OUR RELATIONSHIP WITH NATURE IN A MORE POSITIVE WAY WHICH WILL INFORM MORE CONSIDERED CHOICES. "INTELLIGENCE IS THE ABILITY OF A SPECIES TO LIVE IN HARMONY WITH ITS ENVIRONMENT “ - PAUL WATSON. UKIYO-CO PIECES ARE MAJORITY HANDMADE AND ALOT OF THE FABRIC IS ETHICALLY SOURCED. WHICH PIECES DO YOU THINK COMPLEMENT THE TOTEM’S SCANDAVIAN INFLUENCED FURNITURE? HA HA ! PASSING THE BUCK BUDDY! DIDNT YOU SIT UP ALL NIGHT LOOKING AT WOMENS CLOTHING? I FEEL THAT THE MAJORITY OF THE BRANDS DESIGN AESTHETIC TENDS TO LEAN ITSELF TO THE CLEAN LINES, NEUTRAL COLOUR WAYS AND MINIMALISTIC DESIGN. I GUESS IF THERE WAS ONE PIECE THAT I HAD TO CHOOSE THAT I FELT WE PARALLELED ON, COULD BE THE GRANDPA. ITS A PURE LINEN THROW OVER YOUR HEAD PIECE THAT IS MY ABSOLUTE GO TO. ITS COCONUT BUTTONS GIVE IT ITS RAW FEEL, BUT THE ELEGANCE OF THE DESIGN KEEPS IT MODERN. WHEN IT COMES TO FURNITURE THERE IS LITTLE POINT HAVING A PRODUCT MADE FROM SUSTAINABLY SOURCED RAW MATERIALS IF THE FINISHED PRODUCT ENDS UP IN LANDFILL WITHIN 2 TO 5 YEARS . A LOT OF FURNITURE ON THE MARKET HAS A VERY SHORT LIFESPAN OFTEN DISPOSED OF AFTER A FEW YEARS, AND THIS IS NOT ONLY AT THE MASS-MARKET CHEAPER END OF THE MARKET . IN PART A DISPOSABLE CULTURE IS UNDOUBTEDLY AN UNDERLYING CAUSE, HOWEVER POOR QUALITY AND DESIGN OBSOLESCENCE IS ALSO A MAJOR FACTOR . IF YOU ARE TO GOING TO BE PART OF THE SOLUTION AND NOT THE PROBLEM YOU NEED TO BE PRODUCING OR SELLING PRODUCTS THAT TAKE INTO CONSIDERATION ALL ASPECTS OF SUSTAINABILITY. AT UKIYO-CO WE JUST LOVE NATURAL FIBRES LIKE LINEN AND WOOLS. WHAT FABRICS DO YOU LIKE TO USE TO COMPLIMENT YOUR SPACES? I GREW UP ON SHEEP FARM IN THE SOUTH ISLAND OF NEW ZEALAND SO WOOL ALSO HAS A SPECIAL PLACE FOR ME. I HAVE A COLLECTION OF HANDWOVENVINTAGE AFGHAN WOOL SACKS DYED WITH NATURAL DYES. THESE HAVE BEEN MADE INTO LARGE CUSHIONS WHICH PROVIDE MY MOSTLY NEUTRAL LIVING SPACE WITH SOME STUNNING NATURAL COLOURS AND TEXTURE . I ALSO LOVE THE TEXTURE OF LINEN AND ITS ABILITY TO GET BETTER WITH WEAR. FOR ME THERE IS NO OTHER OPTION OTHER THAN LINEN FOR A SOFA ANYWHERE ON THE COAST . TELL US WHAT PROJECT IS YOUR GREAT ACHIEVEMENT? WHOS YOUR FAVOURITE ECO WARRIOR AND WHY? HE REALLY IS A WARRIOR IN THE TRUE SENSE OF THE WORD , HIS COMMITMENT TO CONSERVATION AND THE ENVIRONMENTAL MOVEMENT IS WAY MORE THAN SOMETHING HE IS INVOLVED IN. IT IS A LIFE MISSION. THE IMPACT THAT SEA SHEPHERD HAS HAD AS A RELATIVELY SMALL ORGANISATION IS A TRIBUTE HIS BELIEF THAT ALL SOCIAL CHANGE COMES FROM THE PASSION AND INTERVENTION OF INDIVIDUALS OR SMALL GROUPS OF INDIVIDUALS. A BELIEF I ALSO SHARE. WHERE DO YOU GO YOU NEED TO REFRESH THE MIND AND INSPIRE YOURSELF? YOGA AND MEDITATION AND MY LOVE FOR DEEP HOUSE ARE MY GO TO’S FOR DAILY SANITY RETENTION. FOR INSPIRATION AND RESET IT IS ALMOST ALWAYS IN NATURE . I AM LUCKY ENOUGH TO LIVE ON ONE OF THE MOST AMAZING COASTLINES IN THE WORLD. INFINITE SKIES ARE VERY SPECIAL TO ME, AS ARE THE DESERT AND MOUNTAIN LANDSCAPES . I LIKE TO STAY PLACES WHERE THERE IS HARMONY BETWEEN THE BUILT ENVIRONMENT AND NATURE, LIKE JOSHUA TREE WHERE YOU CAN FIND SYMPATHETIC ARCHITECTURE AMONGST AMAZING ROCK FORMATIONS . I RECENTLY SPENT SOME TIME AT BAMBU INDAH IN UBUD , EXPERIENCING THE RESULT OF SOMEONES COMMITMENT TO A SUCH A DISTINCTIVE AND RADICALLY DIFFERENT TAKE ON TRADITIONAL LUXURY WAS SUPER INSPIRING.